on January 12, 2017, 9:46 a.m.
With 2016 drawing to a close, YouGov rounded off the year by asking more than 23,000 people across 21 countries to reflect upon how good or bad the year has been for themselves and their families, their country, and the world, and whether they think 2017 will be better or worse. 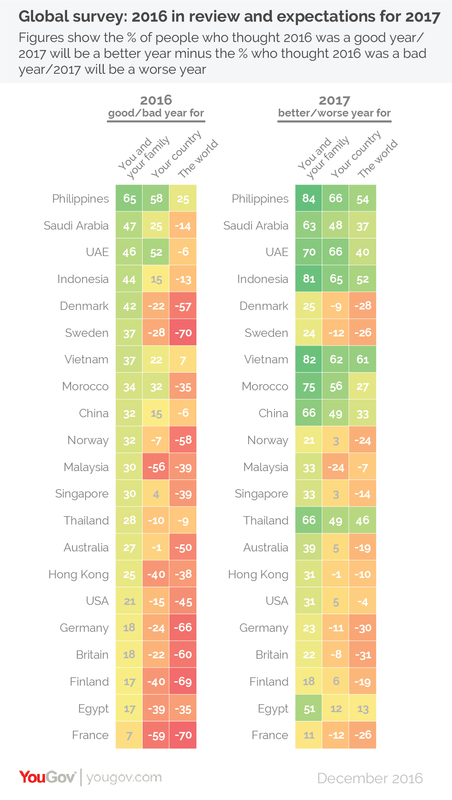 By contrast, the East Asian, Middle Eastern and North African nations are almost universally optimistic about 2017, with huge net positive scores. With a score of -24, only Malaysia bucks this trend - it seems that Malaysians don't think that this year’s problems have been laid to bed, and they are the most pessimistic of all the nations surveyed about how good 2017 will be for their country.